The Millennium has two magnification power ranges controlled by pushbuttons on the front. Magnification in between these ranges is adjusted intuitively by raising or lowering the floating camera. Controls on the front feature reverse image, focus lock, and black & white/color. The Millennium is fully autofocus and gives magnification up to 50x power. It does a lot more than magnify for easier reading. You can use it for crafts, handwork or getting a closer look at objects. It also helps you write checks and fill out forms. The Millennium features the VideoEye patented articulating arm. 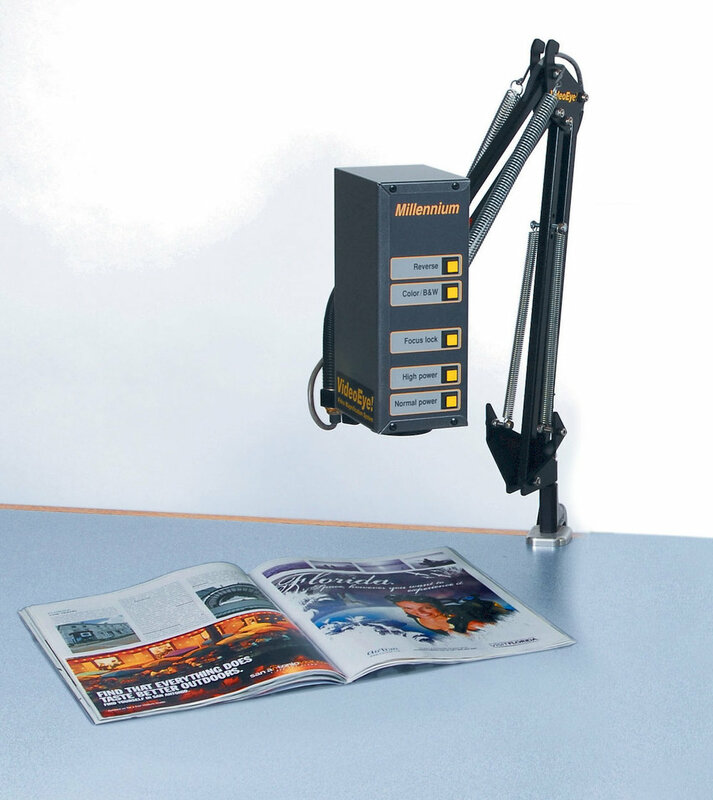 It is precision balanced and moves easily over your entire work surface. It can extend over your lap to help see anything you hold in your hands. The Millennium offers a truly interactive experience. You are in full control of the viewing position and perspective of the camera. Knitting, crafts, artwork, and other hobbies are possible because of the range and flexibility of the adjustable camera head that floats above your work surface on the arm. Converts black on white text into white on black text to give increased contrast. Removes color to make print easier to read. Fixes focus on desired surface to help with writing. Activates high power range - up to 50x power. Note that higher power is achieved with digital magnification, so the image is larger but lower resolution. Increases field of view and changes magnification to lower power. Also makes image sharper because digital magnification is turned off.